Last spring, Nikki Beckett vanished, sucked into an underworld known as the Everneath, where immortals Feed on the emotions of despairing humans. Now she's returned- to her old life, her family, her friends- before being banished back to the underworld... this time forever. As Nikki's time grows short and her relationships begin slipping from her grasp, she's forced to make the hardest decision of her life: find a way to cheat fate and remain on the Surface with Jack or return to the Everneath and become Cole's.. It was on the new-book shelf at my library when I got it and I blogged about it on a Library Monday post a week or two ago. I finished it today because it's due tomorrow and, I mean, it was pretty awesome. It starts off quite oddly, and you soon realize that it's one of those books that you have to read more of to understand. It's split up in chapters, then separated into periods of time that can vary from "Now" to a year before then. 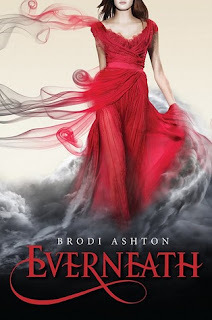 The book starts off with Nikki escaping the Everneath, the equivalent to the underworld and trying to attune back to her normal life before she gets pulled back under. While she's in the read world she has to deal with the people that she left: her family, friends, and Jack, her boyfriend and the love of her life. The two main guys that Nikki has to choose between are Cole, an emotion sucking immortal, and Jack, the high school quarter back. Throughout the book her relationship with both of them grows as her time on the surface comes to a close. Personally I wasn't a big fan of the weird love triangle thing that went on, but I did like how her relationship with Jack grew stronger despite its obstacles. I wasn't exactly sure which guy I should root for in the beginning, but by the middle of the book most of your doubts are settled. Cole being the odd antihero and Jack being the lovable male protagonist. It's not exactly the easiest choice to make with neither being overly better than the other. It's a modern retelling of the Persephone myth and a great escape from reality. It was a quick read for me and if your a fan of anything mythological or paranormal romance-y, check it and you might be pleasantly surprised.